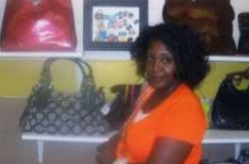 After several years of selling purses and accessories at various events, Kimberly Boozer decided it was time to move her business into a store-front boutique. Kimberly first wanted business counseling, such as that provided by SCORE. She learned of SCORE from Magic Johnson’s book, 32 Ways To Be A Champion In Business, which mentions SCORE as an ideal organization to contact before opening a small business. Following Magic Johnson’s suggestion, Kimberly contacted SCORE and began meeting with SCORE counselor Marge Schneider. During a series of consultations, Marge helped Kimberly evaluate the pros and cons of pursuing her ambition and determine the best course of action for achieving its realization.